Also use it on your bumper, grill, spoiler, trim pieces, etc. The Wheel Woolies Woolie Bully helps you safely and easily clean dirt, grime, and brake dust from various wheel types. 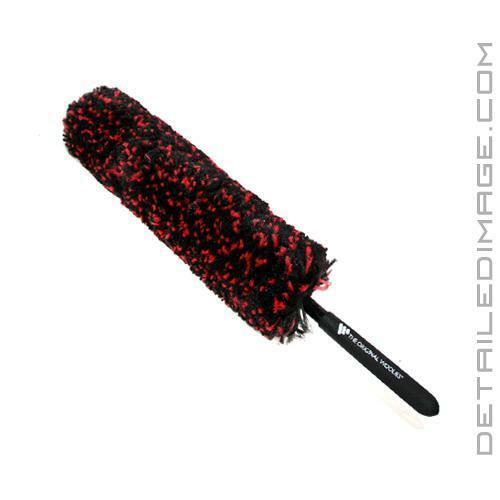 This brush is manufactured with a soft synthetic wool-like polypropylene carpet fiber. The design helps you thoroughly and safely clean not only the face of the wheel but also the inside of the wheel. All of the brush components are 100% polypropylene, ultrasonically welded with no adhesives, glues or staples, which allows you to clean safely and with confidence even on the most sensitive wheel finishes. Use it on wheels that are painted, chrome, aluminum, clear coated, alloy, bare metals, matte and so much more. While the popular original Wheel Woolies feature a cleaning head that extends a few inches down the handle, the Woolie Bully extends almost the entire length of the handle. There is only a small section, just enough for you to grip the brush with your hand. This provides you with more cleaning area for a quicker and more efficient wheel cleaning experience. This versatile brush comes in two great sizes and helps you clean any area of the wheel and other parts of the car with ease. If you are looking for a new wheel brush, the Wheel Woolies Woolie Bully is a great one to pick up! When it absorbs water it is very heavy. Does not fit between wheel and disc brakes.